The Winchester Mystery House, located in San Jose, California, was built between 1884 and 1922. The house know as the house built by the spirits, was built by Sarah L. Winchester, widow of William W. Winchester who was known for the iconic Winchester Rifle. This house holds a lot of history. The house was under continuous construction for 38 years. According to legend, the house is thought to be haunted by the ghosts of those people who died by the Winchester Rifle. It was believed by Sarah Winchester, that it was only through constant, around the clock construction on the house that the spirits would remain calm. 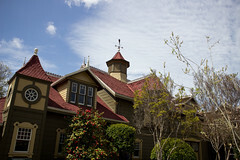 The Winchester Mystery House, built in Queen Anne Victorian style, boasts 160 rooms. It was thought that at one time the house actually had between 500-600 rooms, but many were redone greatly reducing the number to what remains today. Visitors to this house have been warned not to stray away from the guided tour, as the odds on getting lost within the confines are quite high. There are several staircases and doors that lead to nowhere. There are also secret panels throughout the house. Sarah Winchester also had a seance room built in the house. Sarah believed there were good, as well as bad spirits that lived in her house. She desired to befriend the good ghosts and build nice rooms for them to stay in. She also wanted to keep the bad spirits at bay by confusing them as much as possible. Grand Estate Tour: This tour is over 2 hours long which consists of a 65-minute guided tour of the inside of the mansion, and a 55-minute Behind-the-Scenes tour of the Winchester Mystery House. Mansion Tour: This guided tour leads you through 110 of the 160 rooms located in the mansion. The Behind the Scenes Tour: This part of the tour offers not only information about Sarah Winchester, and the mystery surrounding her eccentricities, but information on a bygone time of Victorian elegance. The Garden Tour: Beautiful, Victorian gardens surround the Winchester Mystery House. should you decide to visit, you owe it to yourself to revel in this splendor. The garden tour is a self-guided tour, so relax and take your time! This house would be interesting to visit at Halloween or any time! I visited the Winchester House back in the 70’s. It is one freaky place for sure! Thanks for the trip down memory lane! Glad I could help you enjoy a fun, albeit freaky time, Olive! My girlfriend and I took a tour of the Winchester Mystery House, and let me tell you-it’s one trippy place! Doors that lead to nowhere, etc. It looks like a cool place, Latesha. I have always wanted to visit it myself.